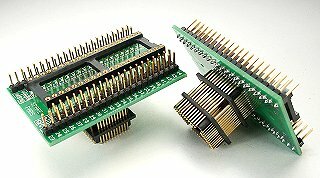 An emulator adapter provides a DIP socket on the top and plugs into a PLCC production socket or solders down to a QFP land pattern. 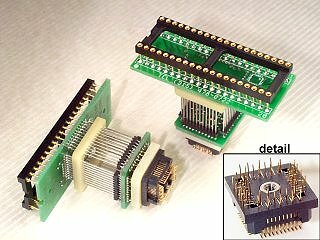 We offer both generic 1:1 wired adapters and device specific adapters. 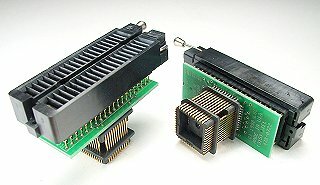 This page includes the most popular emulator adapters, use the searches above to find adapters not listed. Click on Adapters in the menu above to search by device manufacturer. 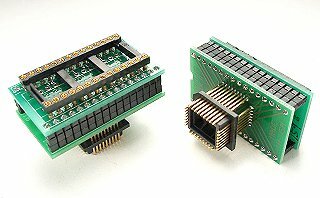 Click on the blue part numbers below for photos and data sheets or to order our adapters. 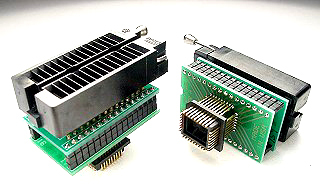 Most of our emulator adapters offer a choice of Aries DIP ZIF socket or open-frame socket. Our PLCC plugs are supplied in a standard height of 21.6mm. They are available in 29.2mm by request. If clearance is still an issue let us know and we'll work with you. 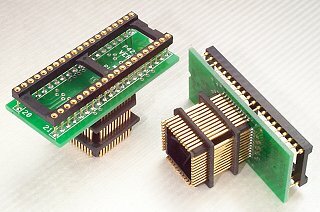 DIP / QFP Emulator Adapters - user configurable (shown with optional ZIF socket).